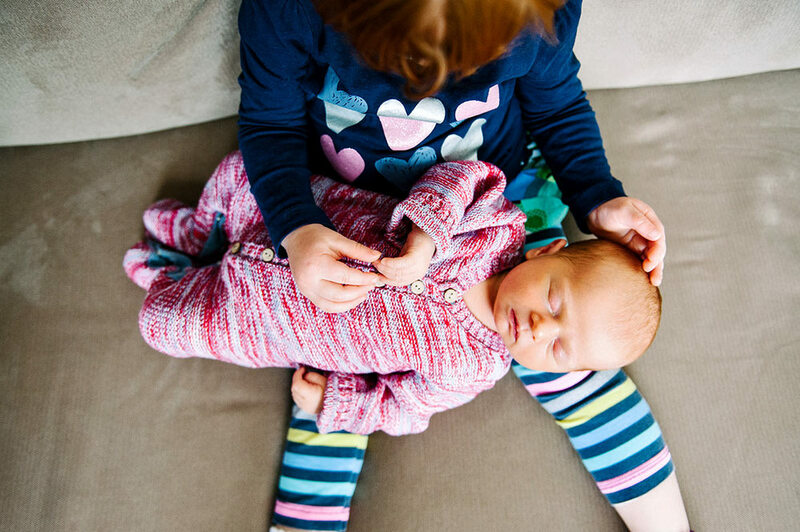 We hold newborn sessions in your family home. By holding your session in your home at a time convenient to you we minimise disruptions to new mums and babies. We bring along blankets, lighting gear, and everything we need. We might set up in your living room, the bedroom, the hallway, or wherever the interesting light and composition takes us. This means your newborn photos will be personalised for your family - no two newborn sessions we shoot are alike. We aim to capture just what it means to be a part of your family during your newborn photography session. Your photos will reflect who you are, and the home that has welcomed a very new addition to the family. We approach our newborn sessions from more of a lifestyle perspective, with less of an emphasis on anything too posed. During your session we keep everything at a very relaxed pace. If bub is upset we'll take a break. If mum needs to feed that's perfectly fine. We'll stay as long as required to provide you with a complete set of photographs. Sometimes we're finished in an hour, and other times it takes up to three. We hold your newborn session in your home to keep disruption to an absolute minimum. Don't worry if you think your home is possibly too small or too dark - we have a portable studio that we can set up in almost any room that creates all the light we need. After you've made your booking with us we'll be in touch with advice on how to best prepare for your session. Preparing for your session is really simple, but we'll answer a few common questions such as "What should we wear?" and we'll provide a few tips on how to keep the little ones at their happiest during your session. We'll provide all these details during the lead up to your booking. You'll receive a secure, online gallery with your full set of images. You can review absolutely everything before you decide what you'd like to purchase, whether you're choosing prints, digital files, an album, or one of our packages. We offer a lot of different products, including digital files, and we run through all the details in our pricing brochure. We also list some of our most popular packages in case you're a little unsure about what to choose. We charge a session fee of $190 which covers the session itself. You don't need to decide which products (prints, files or albums) you'd like to purchase until after you've seen your photos in your private, online gallery. Please call or send us a quick email if you'd like our full pricing details. Contact us by phone or email, and we'll reply with our availability so we can set a date. We usually suggest a session within 7-10 days after your due date. We'll be in touch during the lead up just to see how everything is coming along, and if we need to postpone for any reason at all we'll find a new date that suits you best. Give us a call (02-8957-5757 or 0434-934-766) or send us an email.